Ruthai’s Thai Kitchen in Mt. Lookout – Go There. Try That. I’ve probably driven by Ruthai’s Thai Kitchen a thousand times. I don’t know why I didn’t stop sooner. Thankfully, I came to my senses one night when we were driving hungry; we made a last minute decision to finally stop! Hallelujah, am I glad. The restaurant is roomier inside than it appears. It’s basically divided into two sections. The first section includes more traditional style seating with low tables and oversized pillows. I gotta say, I kind of enjoy taking my shoes off and getting cozy; I won’t swear to being graceful with the landing though! A few years ago, when my sinuses were particularly a mess, I lived on Thai hot and sour soup. It was the only thing I could taste. I still love it because it’s aromatic and spicy. 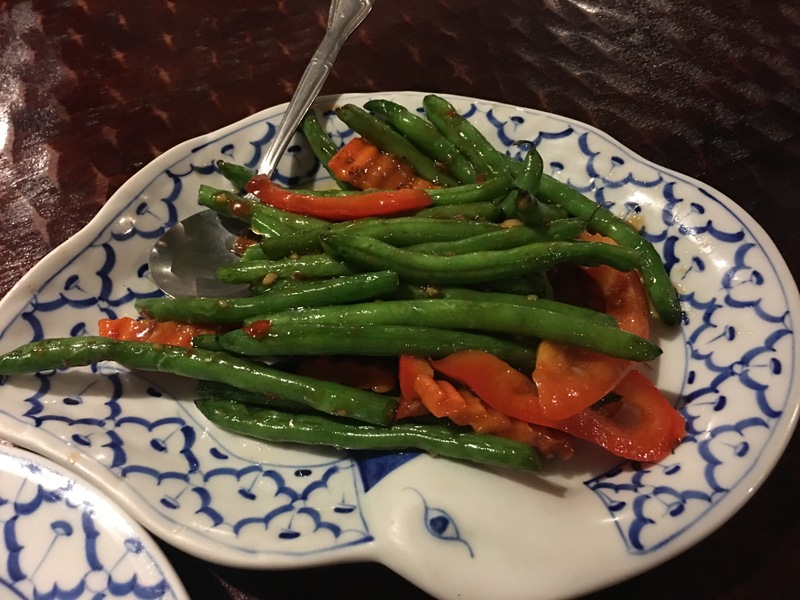 It’s typically served with shrimp, but a veggie version is always available. Ruthai’s Hot and Sour Mushroom, for me, is a must. 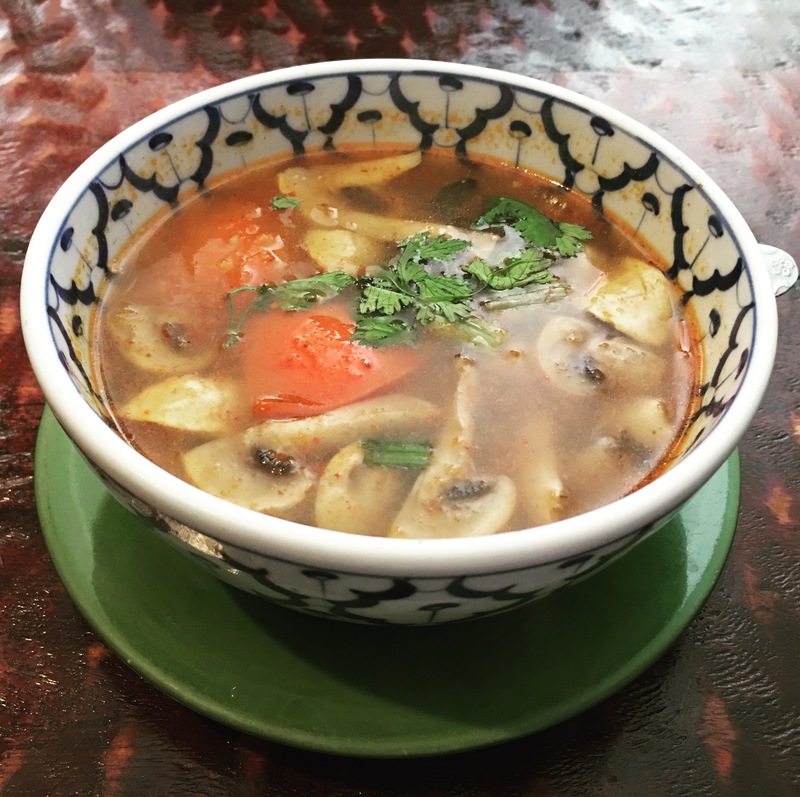 It’s a gorgeously fragrant melody of fresh mushrooms, chili pepper, tomato, and spices in a lemongrass broth. The only other app I’ve tried so far is the Garlic Green Beans. OK, let me clarify; the garlic green beans might not be an appetizer, but who says splitting a dinner dish can’t be the “start” a meal? You might want to break the rules too because these beans are sautéed in the perfect amount of soy sauce, and are crisp and loaded with garlic. 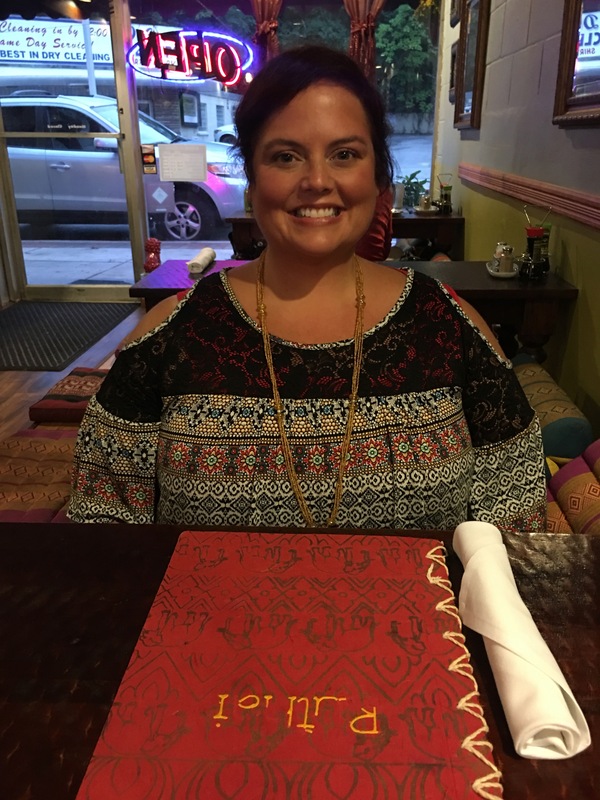 We’ve ordered and enjoyed several dishes at Ruthai’s including the Shrimp Curry (pineapple, bell peppers, carrot, and snow peas in yellow curry and coconut milk) and the Pad Thai (thin rice noodles, bean sprouts, green onion, and Pad Thai sauce). My favorite order so far is definitely the Vegetable Basil. I turn it into Chicken Vegetable Basil because while I love all the veggies, I’m a meat-makes-everything-better kind of person. I was told once that Thai food uses Holy Basil (like that’s the legit kind of basil . . . I googled it). How appropriate since this dish is bright, comforting, layered, and light all at the same time. I can smell the fresh basil before the plate hits the table. I’ve been trying to name what it is I love so much about Thai. I think it’s the depth of flavor: spicy, sour, sweet, herbaceous. 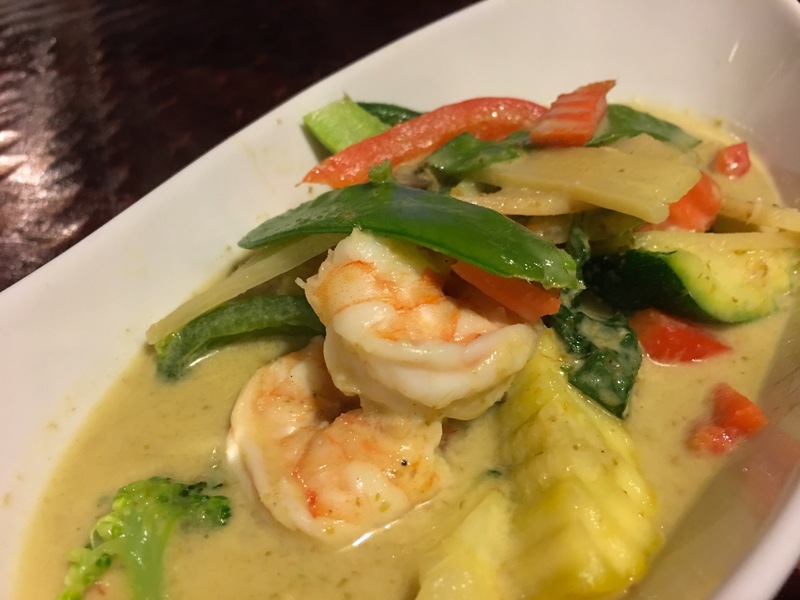 Ruthai’s Thai Kitchen gets that balance. The menu is loaded with noodle dishes, seafood dishes, rice dishes, curry dishes, and sushi. Maybe I shouldn’t be so happy that I “discovered” Ruthai’s because this is dangerous. Deliciously dangerous. Yep. I’m gonna say it. Here it goes. Ruthai’s is my new favorite Thai place in the city. Boom! Buyer Beware: the spicy scale is mild, medium, hot, and Ruthai hot. The medium is hot; perfectly hot. If you go beyond the medium, keep your beverage close at hand! 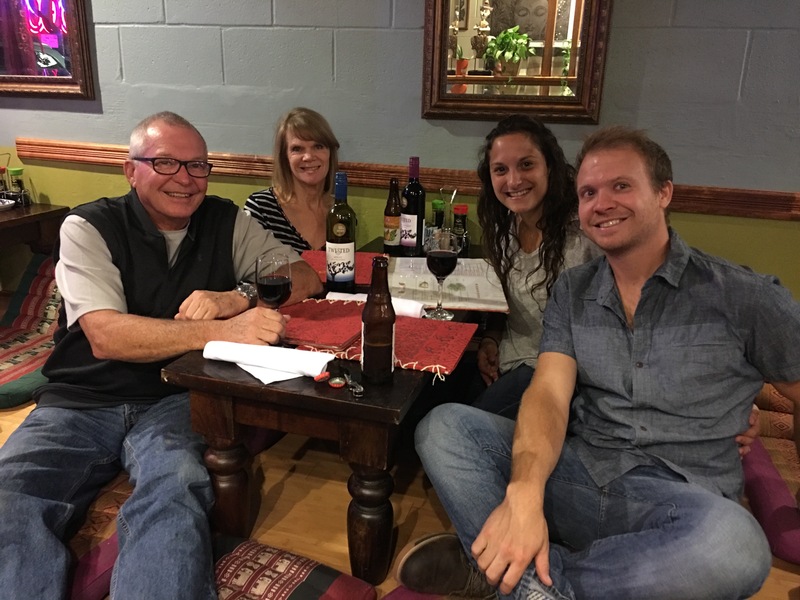 Tip: Ruthai’s is BYOB so if you like an adult beverage with your meal, feel free to bring it with you. GO THERE (Ruthai’s on Linwood Ave.)! 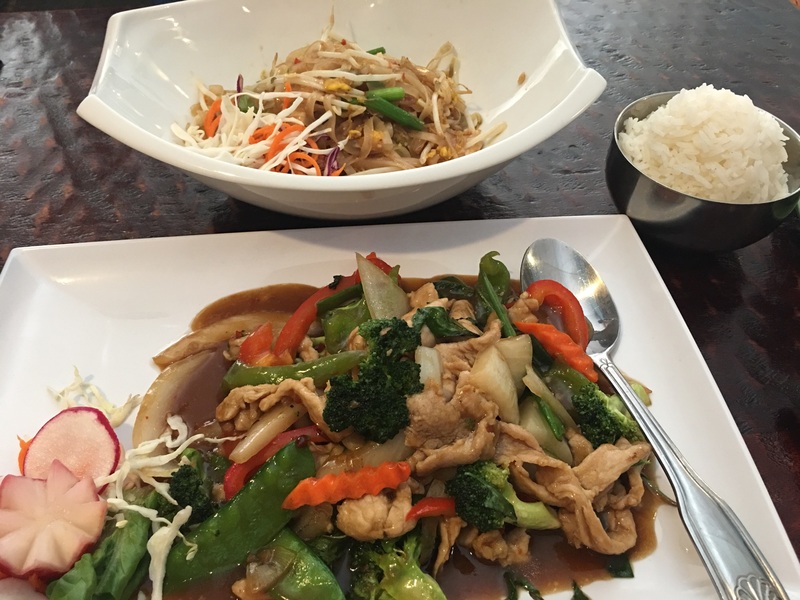 TRY THAT (Thai Basil)! Clermont Springs Deli on Beechmont Ave.
Let’s go together! You will love the basil!